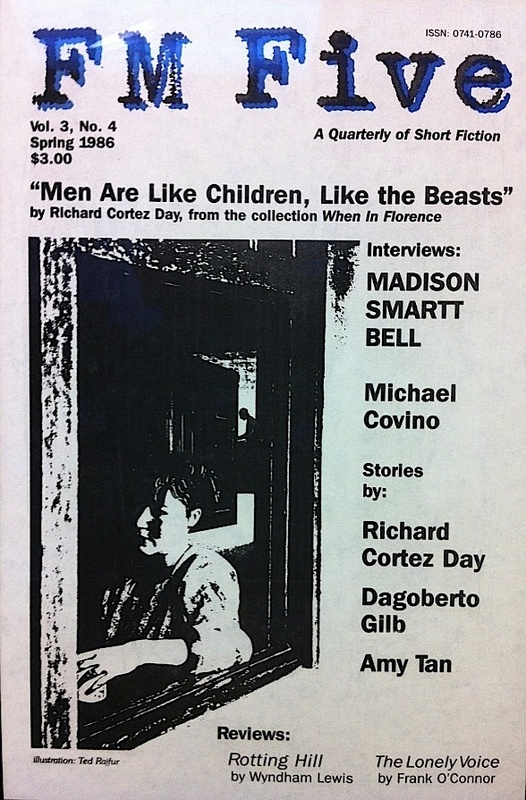 The Short Story Review [ISSN: 0741-0786] was an independent San Francisco-based literary journal operating between 1983 and 1989. Chris Gabbard founded the journal and was its chief editor. He had considerable and indispensable help from Stephen Woodhams, who served as Fiction Editor. The two of them had studied creative writing at San Francisco State University under Gina Berriault, Leo Litwak, Michael Rubin, and Herb Wilner. The editorial board consisted of Elea Carey, Beth Overson, Leza Lowitz, Lynn Gray, Anthony Caquelin, Tema Goodwin, Susan St. Aubin, Cathy Jacob, and Ted Rajfur. 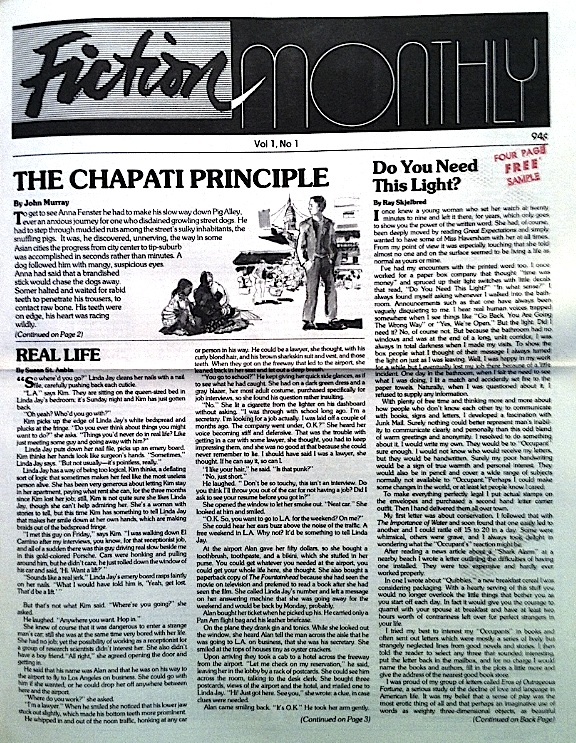 Ted Rajfur also illustrated a number of the stories. Lynn Gray and Judith Slater conducted most of the interviews. 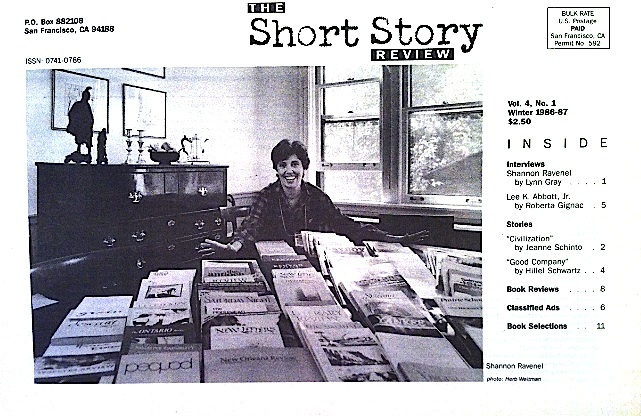 The Short Story Review played a small part in the short story renaissance of the 1980s. 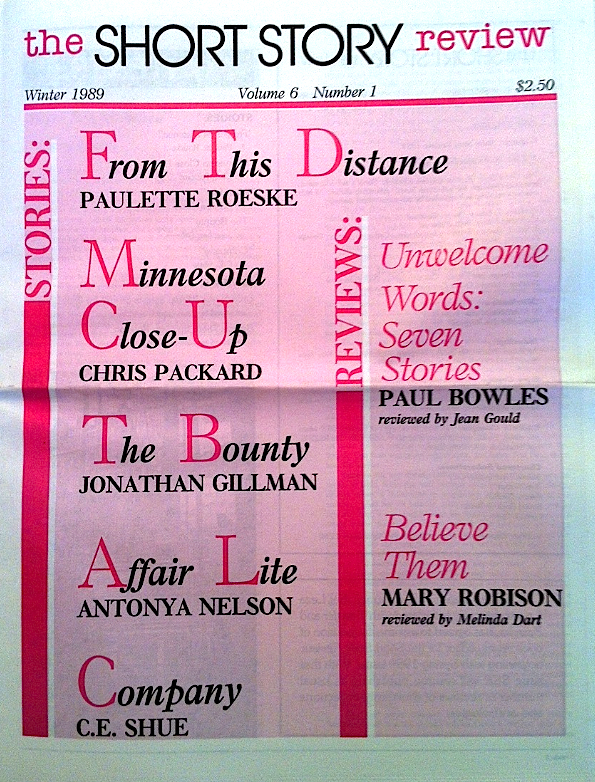 “The 1980s were the golden age of the short story,” writes Bob Hoover of the Pittsburgh Post-Gazette. *1 Raymond Carver, Ann Beattie, Bobbie Ann Mason, Tobias Wolff, Richard Ford, Mary Robinson, and others reawakened interest in what had been a dormant genre. 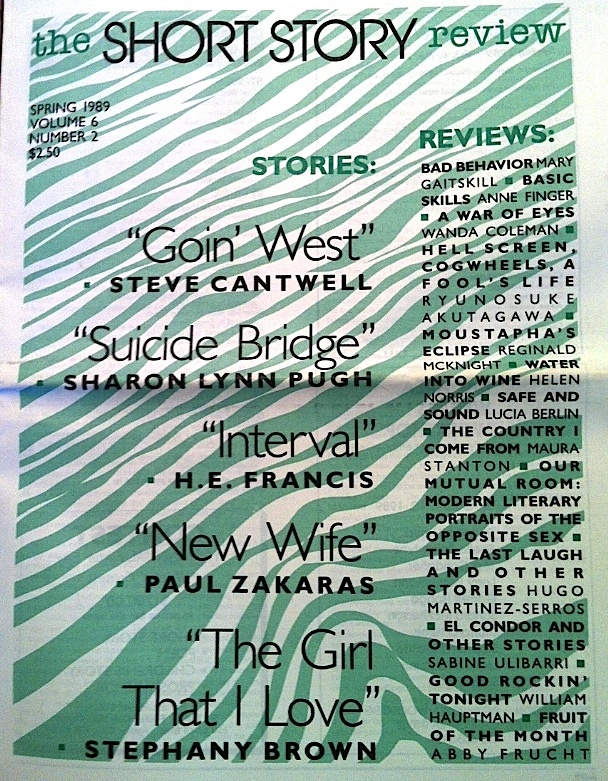 Showcasing emerging short story writers as well as authors of established reputation, The Short Story Review began operation at roughly the same time as several other literary magazines in the San Francisco Bay Area, most notably Wendy Lesser’s The Threepenny Review, Jay Schaefer’s Fiction Network Magazine, and Howard Junker’s Zyzzyva. 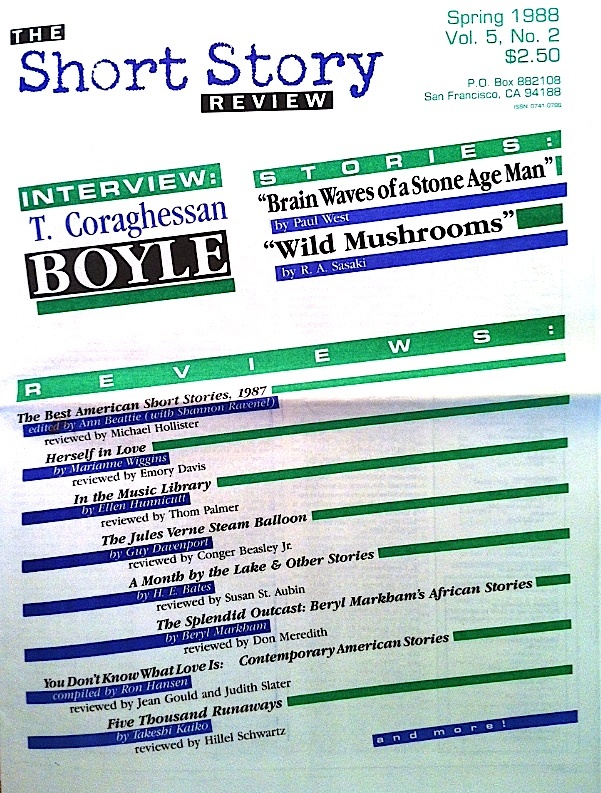 With the partial exception of Fiction Network, The Short Story Review differed from the others by focusing exclusively on the short story as a formal literary genre. 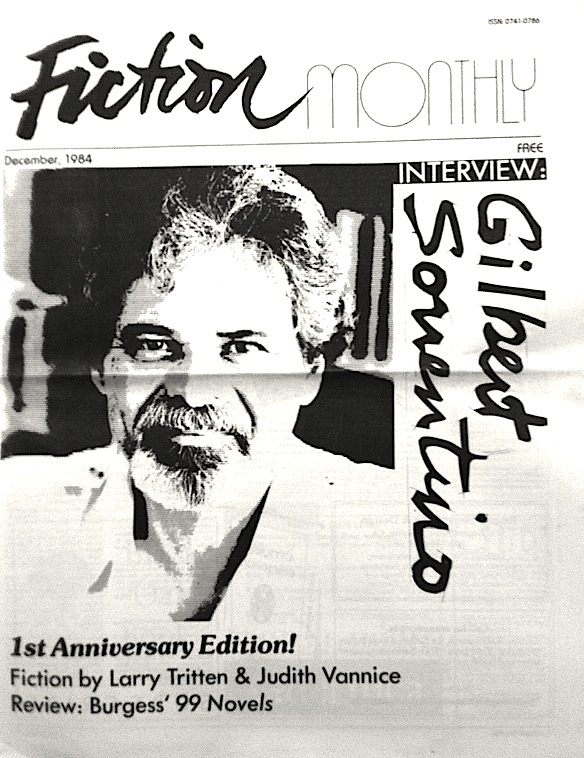 The editors’ aim was to cater to the local community of fiction writers in the same way Joyce Jenkin’s Berkeley-based Poetry Flash served the bay area poetry community. 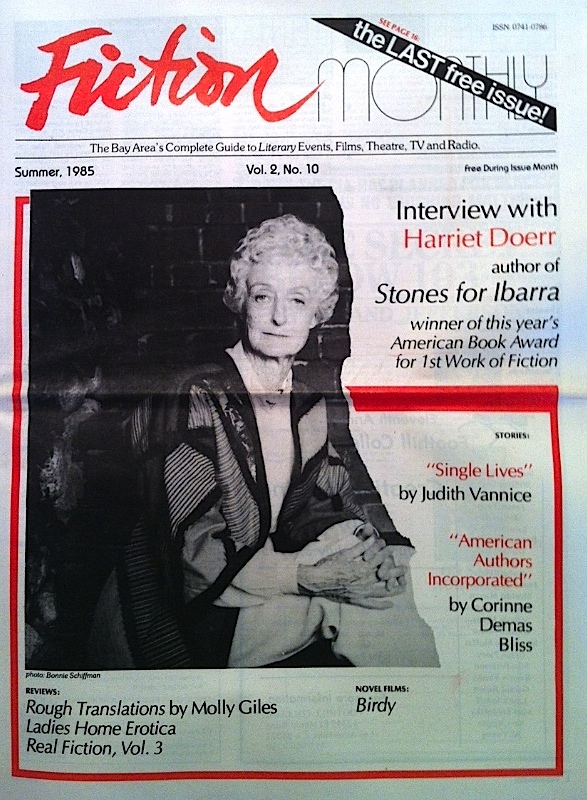 Indeed, the editors were eager to carve out a niche for a young generation of short story writers in a region strongly dominated by the poetry of the aging Beat generation. In addition to providing a venue for original short stories (it regularly published manuscripts from its slush pile), it actively solicited new work from well-known authors. 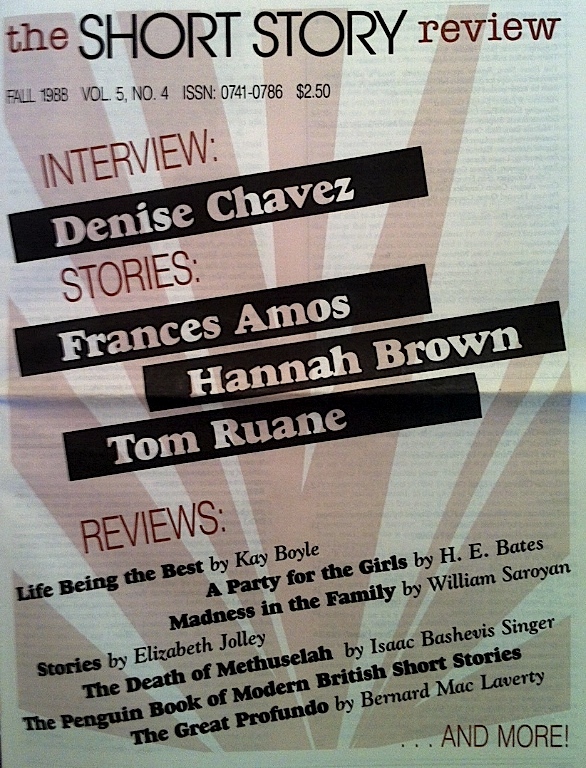 Along with original fiction, it included interviews with writers, reviews of recently released short story collections produced by small presses and major publishing houses, and a monthly calendar of local fiction readings. 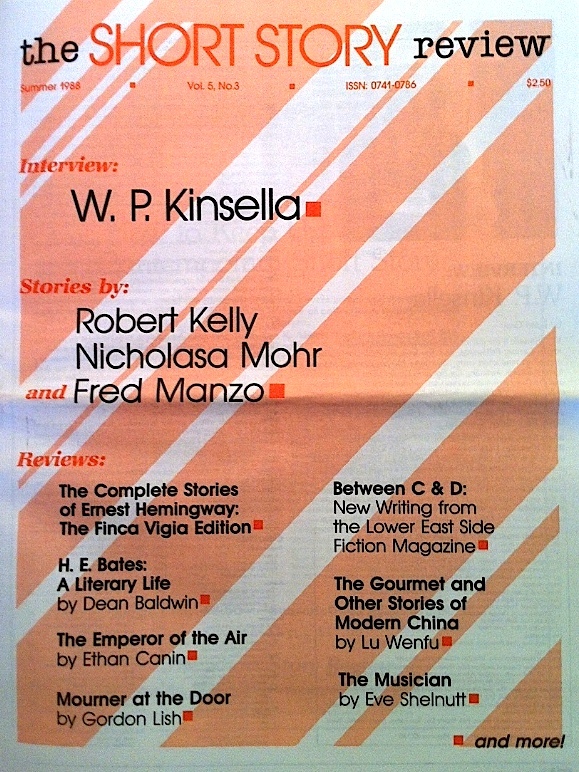 By selecting medium-length, minimalistic pieces written in spare prose and in the mode of literary realism, the editorial board attempted to follow in the tradition of the genre’s masters: Anton Chekhov, James Joyce, Kate Chopin, Eudora Welty, Ernest Hemingway, Sherwood Anderson, and Flannery O’Connor, to name a few. Other notable authors it published were Antonya Nelson (“Affair Lite,” 6.1), Rudolfo Anaya (“The Place of the Swallows,” 1.3), Dagoberto Gilb (“Night Work,” 3.4), Herbert Gold (“Meester Boris,” 1.4), Alice Adams (“Computers Are Human Too,” 1.7), Nicholasa Mohr (“I Never Even Seen My Father,” 5.3), Paul West (“Brain Waves of a Stone Age Man,” 5.2), R. A. Sasaki (“Wild Mushrooms,” 5.2), Judith Slater [Vannice] (“Single Lives,” 2.10; “A Christmas Story,” 2.4), Toni Graham (“Skin and Bone,” 3.2; “Haunted,” 4.2), H. E. Francis (“Traveling,” 2.3, “Interval,” 6.2), Arturo Vivante (“Taste of the Rainbow,” 2.7), Mark Coovelis (“Love Is Something Else,” 5.1), and Alvah Bessie (“Remembering Jack London,” 2.5). 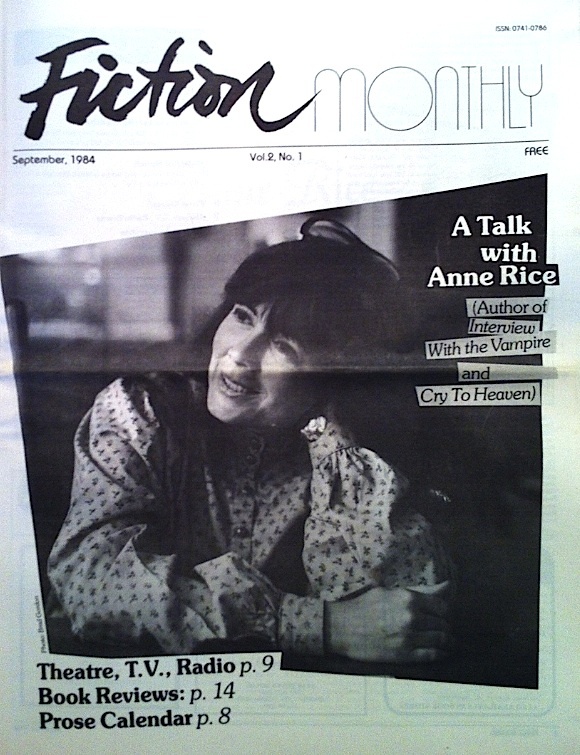 Additionally, it featured interviews with Anne Rice (2.1), Bobbie Ann Mason (1.6), Lee K. Abbott (4.1), Paula Gunn Allen (2.8), Madison Smartt Bell (3.4), T. Coraghessan Boyle (5.2), Ron Carlson (4.3), Denise Chavez (5.4), Carolyn Chute (3.1), Tom Clark (poet) (3.3), J. California Cooper (3.2), Michael Covino (3.4), Harriet Doerr (2.10), Dagoberto Gilb (4.4), Amy Hempel (4.2), Amy Kaufman (4.4), W. P. Kinsella (5.3), Ron Loewinsohn (2.6), Tim O’Brien (4.2), Shannon Ravenel (editor of Best American Short Stories) (4.1), Lynn Sharon Schwartz (5.1), Gilbert Sorrentino (2.4), Alice Adams (1.7), and Tobias Wolff (3.3). 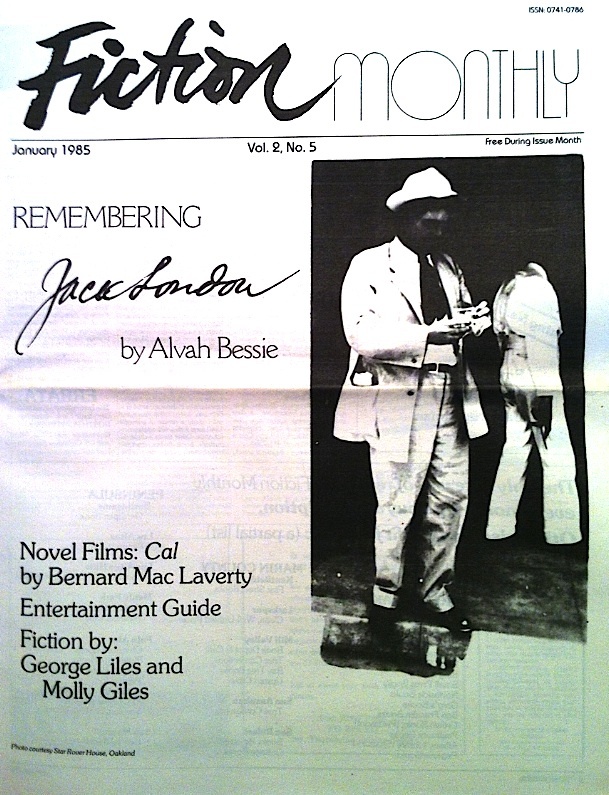 Other writers whose work appeared were Francis Amos (“The Melon Furrows,” 5.4), Barbara Baer (“The River Seder,” 3.2; “Half the Wooing,” 4.2), Rosaleen Bertolino (“On the Desert,” 2.3), Corinne Demas Bliss (“American Authors Incorportated,” 2.10), Fred Bonnie (“A Settlement of Wages,” 5.1), Hannah Brown (“The One with the Most Earrings,” 5.4), Stephany Brown (“The Girl That I Love,” 6.2), Anne Calcagno (“Martine,” 1.7), Steve Cantwell (“Goin’ West,” 6.2), Melinda Dart (“Sunset,” 2.9; “The Handy Man,” 2.9), Richard Cortez Day, (“Men Are Like Children, Like the Beasts,” 3.4), Emory Davis (“The Uninvited Guest,” 4.4), Lisa Drew (“Flora’s Taste,” 3.3), Margot Duxler (“Music,” 3.1), Peter Fish (“Imperial Beach,” 2.1), Carol Gamble (“Jehednick’s Comet,” 3.1). 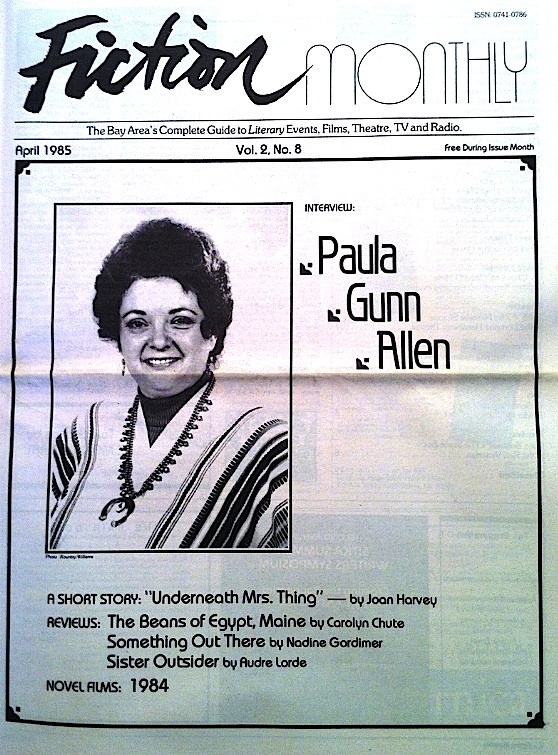 Molly Giles (“What Do You Say,” 2.5), Jonathan Gillman (“The Bounty,” 6.1), Avram Gimbel (“The Challenge,” 1.4), Jean Gould (“Retreat,” 1.4), Geoffrey Green (“Dreamless,” 3.3), Myron Greenman (“Lightening Kenneth,” 1.7), Joan Harvey (“Underneath Mrs. Thing,” 2.8), Catherine Jacob (“Long Distance,” 4.3), Ronald Johnson (“Billie,” 1.5), Robert Kelly (“The Hole,” 5.3), Robin Kirk (“Yesterday,” 2.2), George Liles (“Doing the Necessary,” 2.5), Lynn Lauber (“Deer Crossing,” 3.3), Fred Manzo (“Earning Points,” 5.3), Isabelle Maynard (“Sweet Revenge,” 1.5), Don Meredith (“Einstein’s Bike,” 3.2), John Murray (“The Chapati Principle,” 1.1-2; “Not At All,” 1.3), Jane Nudelman (“Izzy and the Duchess,” 2.6; “America Is for The Children,” 2.1), Chris Packard (“Minnesota Close-Up,” 6.1), Tom Parker (“The Woman Who Hated Short Stories,” 2.2), Peter Pickering (“The Fat Man,” 1.5), S. L. Pugh (“Suicide Bridge,” 6.2), D. L. Pughe (“Hoot,” 1.2), Paulette Roeske (“From This Distance,” 6.1), Tom Ruane (“Ghosts,” 5.4). Lisa Ruffolo (“Words of Love,” 5.1), Jeanne Schinto (“Civilization” 4.1), Hillel Schwartz (“An Attribution,” 3.1; “Good Company,” 4.1; “Sleeping Beauty,” 5.1), C. E. Shue (“Company,” 6.1), Ray Skjelbred (“Do You Need This Light,” 1.1; “The Dinner Party,” 1.3; “The Man Who Saw Gaslight,” 1.7), W. A. Smith (“Delivery,” 3.1; “Remember That Road,” 3.3), Susan St. Aubin (“Real Life,” 1.1), Larry Tritten (“The Word,” 2.4), Kirby Wilkins (“Strange Shores,” 1.3; “Sign,” 1.6), Stephen Woodhams (“Coming Around the Horn,” 1.6), and Paul Zakaras (“New Wife,” 6.2). The Thomas G. Carpenter Library at the University of North Florida in Jacksonville houses a complete run of The Short Story Review. Questions about the holdings can be directed to Special Collections Librarian Aisha Johnson (a.johnson@unf.edu). Questions about the journal itself should be directed to Dr. Chris Gabbard at the English department of the University of North Florida (cgabbard@unf.edu). *2 Tan, Amy. The Joy Luck Club. 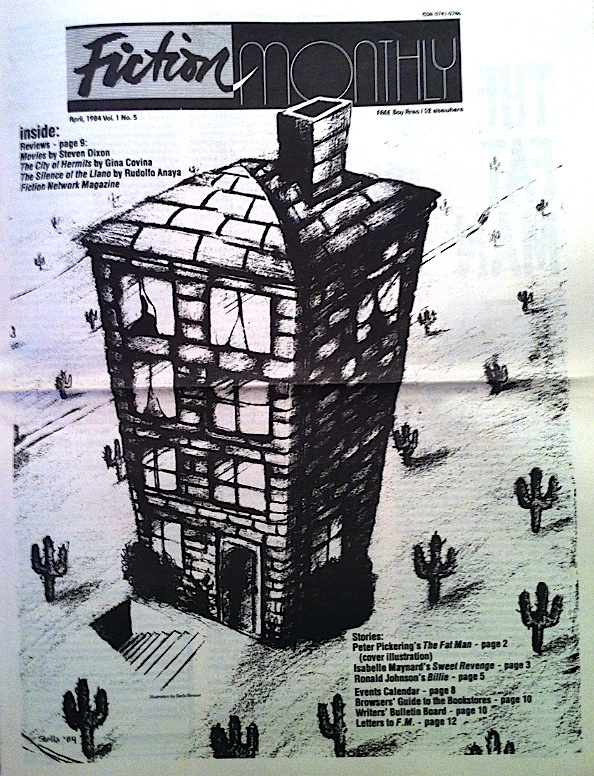 New York: G. P. Putnam’s Sons, 1989. 4. 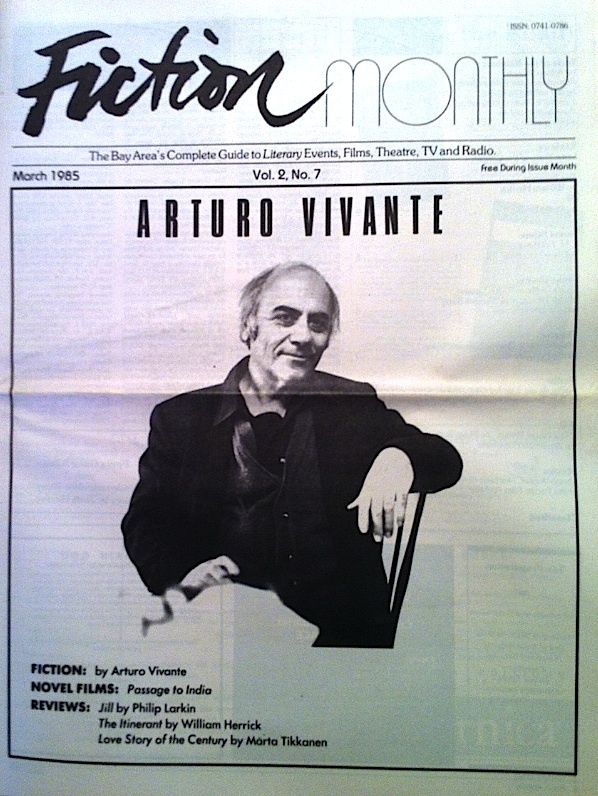 This entry was posted in Alice Adams, Amy Hempel, Amy Kaufman, Anne Rice, Antonya Nelson, Arturo Vivante, Bobbie Ann Mason, Carolyn Chute, Chris Gabbard, Dagoberto Gilb, Denise Chavez, Elea Carey, Gilbert Sorrentino, H. E. Francis, Harriett Doerr, Herbert Gold, J. California Cooper, Lee K. Abbott, Leza Lowitz, Lynn Gray, Madison Smartt Bell, Mark Coovelis, Michael Covino, Nicholasa Mohr, Paul West, Paula Gunn Allen, R. A. Sasaki, Richard Cortez Day, Ron Loewinsohn, Rudolfo Anaya, Short Story Review, Stephen Woodhams, Susan St. Aubin, T. Coraghessan Boyle, Tim O'Brien, Tobias Wolff, Tom Clark, Toni Graham, W. P. Kinsella and tagged Anthony Caquelin, Beth Overson, Carpenter Library, Cathy Jaob, Chris Gabbard, Elea Carey, Fiction Monthly, FM Five, Leza Lowitz, Lynn Gray, San Francisco, San Francisco State University, Stephen Woodhams, Susan St. Aubin, Ted Rajfur, Tema Goodwin, Thomas G. Carpenter Library, UNF, University of North Florida. Bookmark the permalink.